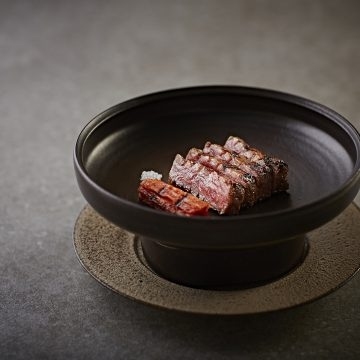 Kim Byung-jin of the three-starred Michelin restaurant Gaon has a passion for Korean cuisine like no other. Inspired by dishes and flavors from centuries past, he has dedicated his career to tirelessly studying and developing recipes that reflect what he believes is the essence of Korean cuisine: natural simplicity. Lightly burn the onion, spring onion, and garlic on the grill. Put roasted vegetables, soy sauce, mirin, grain syrup, water, dried red pepper, pear, and peppercorn in a pot, and boil. When it starts to boil, reduce to low heat and simmer it for 30 minutes. After 30 minutes of simmering, strain the content and allow it to cool. Add chopped onion, garlic, and spring onion to strained liquid, place in a container and cover. Allow it to age for two days. Mix the onion, garlic and onion with the aged soy sauce for grilling from steps above. Make shallow cuts on the sirloin steak diagonally in one direction on both sides. Marinate the sirloin in pear juice for 12 hours. Then marinate the steak in the meat marinade from step 1 for an additional 2 hours. Put the marinated sirloin in the refrigerator. Mix all the ingredients for the marinade sauce for grilled deodeok and refrigerate for 24 hours. Peel the deodeok, halve them lengthwise, remove the hard part in the center, and lightly press down deodeok with a rolling pin to make them tender. Mix deodeok with the marinade sauce from Step 1, lightly cook them in an oiled frying pan, and then grill them on charcoal fire. Roast the marinated sirloin to desired cooking preference on a charcoal fire, and serve with grilled deodeok.